I am not a great lover of Christmas, but one of the memories that will remain in my heart was the breakfast cooked by my son-in-law for all of us on Boxing St Stephen’s Day (well… I was in the south of Ireland remember!). A bitterly cold morning was soon forgotten as we tucked into his very own, made from the ground up Yee- Haw Yankee Breakfast Pancakes. With yummy Blueberries. I recognise that plate and I want more pancakes! The only sounds were “Pass the Maple Syrup please” and “Any more ready yet, Uncle George?” From seven to Seventy there were happy faces all around the table. Huh! They were blaming me because they lost weight. Seriously though, they have both lost weight, look and feel better and are eating far more healthily. This entry was posted in Lunches/Suppers, Miscellaneous, recipes and tagged Breakfast Surprise, Miscelleanous on January 11, 2010 by Grannymar. Hmm not sure how he lost weight eating pancakes and maple syrup but they do look delish. So tickled to see this food section! Actually have a food question that I hope you know the answer to. Mom says her side of the family is English and Irish. Are you familiar with “cheese and milk on toast”? One of my personal favorites and Mom’s not sure where it came from, just that we love it and grandma fixed it. Not a burning issue, but something we wonder about and don’t know the answer to. The truth is that when a man cooks, at home that is, it is a big event. You have to make a fuss of him and tell him what a great cook he is or there will be no repeat performance. Ever. Seriously, though, I’m sure the pancakes were lovely. It certainly sounds as if they were……..
I’m cooking “herbed pork and potatoes” tonight for dinner, any idea how I can get that fuss make over that Gaelikaa refers to? Baino – he didn’t have them everyday… I hope! Margaret – The “cheese and milk on toast” you mention sounds a little like Welsh Rarebit. If George has no plans to cover it at Not Junk Food, then I will. Been there, admired the blog, bookmarked for future visits and shall use the recipes – one man to another. Gaelikaa, there is no one to give me sabaash. I still cook up a storm when the mood takes me. My hubby makes breakfast every morning now. It more than compensates those 100 plus years I got up at 5:30 or 6 am and made coffee, cooked breakfast for all and made up lunch bags for the girls to take to school. How I longed for the day I could sleep in until 7! 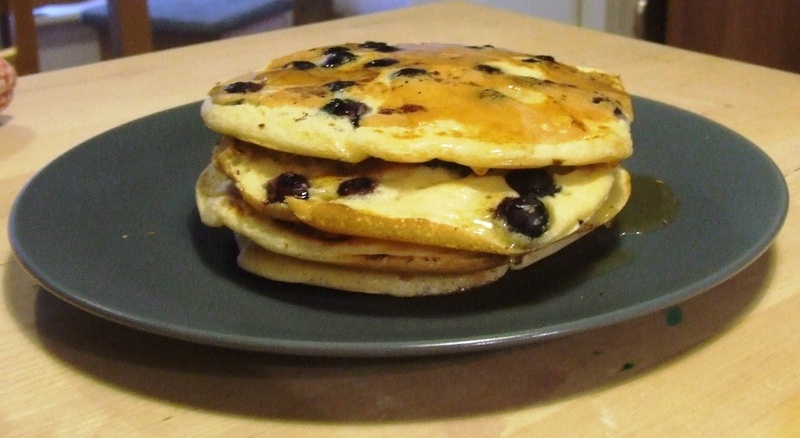 He makes blueberry (or some kind) of pancakes usually once a week, but doesn’t separate the eggs like George does. He does produce a wonderfully soft pancake by using low- or non-fat buttermilk (or sour milk) instead of regular. I wonder if you have the equivalent in Ireland? Lover of pancakes here. Make them with choc chips, or bananas, or peaches, or blueberries, or plain. Will have to check out George’s. I’ll diet tomorrow… or the next day… or not. Alice – We do have Buttermilk in Ireland, a very important ingredient for wheaten bread and many other recipes. Brighid – I mother’s motto was ‘A little of what you fancy, does you good!’ She didn’t believe in diets or having a weighing scales in the house. We are all greyhounds. Go and find yourself a mature Birch tree. Drill a hole at a slight upward angle into the trunk to take a piece of plastic tubing (if you haven’t access to laboratory supplies then fish tank tubing is great…same stuff really) push the tubing just into the hole. Hang a container bellow the hole and dangle the tube into it. Check regularly and you should find the sap from the tree running into the container. Collect the liquid. You can either use it to make Birch sap wine or boil it down to make Birch syrup. When you have finished tapping then stop the hole with clay (or some such) for future years. Any way I keep trying to persuade the neighbours to let me tap their Birch tree. Grannyma, I have started to peel my potatoes, can you give me a hint on how to proceed? My wife is not home yet, and dinner is suppose to be ready when she arrives. Good Lord, what did I get myself into. Magpie – I can always depend on you to come up with something unusual! One of our newer traditions is Christmas morning breakfasts fixed by my son John. He makes Macademia nut pancakes while his wife, Kym fixes Mamosas for us (Orange juice and Champagne) and between the pancakes and the drink, we are ready to open present. I love blueberry pancakes. It has been a long time since I made anything from scratch, but maybe it is time I try the recipe. Maria, I bet the pancakes are extra special when your son John makes them. Mamosas….. Orange juice and Champagne, we call that Bucks Fizz. Thanks for the follow up on “cheese and milk on toast”. Here’s the Kansas, I’m hungry and in a hurry, variation. Pop the bread in the toaster, pour about a cup of milk in a microwave-safe container, add chunked-up cheese (whatever is in the fridge) and nuke until milk is hot, cheese is melted. I prefer sweet cheese, but remember Grandma using cheddar. Pour over buttered toast, salt and pepper to taste. And you have it, a meal fit for a king or at least a cheese lover. Maynard could even do this!! For those on a diet, low fat milk and no butter.